You are a rookie boxer taking on the World Video Boxing Association (WVBA). 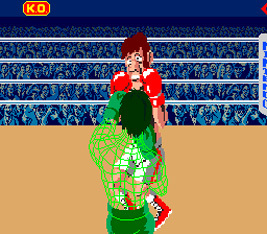 You must fight through a series of boxers, dodging left or right and hitting the opponent with left and right hook combos. Each boxer has a slightly different fighting style that you need to learn. When the boxer's eyes flash, it's time to dodge and hit back. Pulling off combos increases your Power Bar. When it's at full strength you can unleash a KO combo that will beat the opponent. If you are knocked down, however, you must tap the button to stand back up and reenter the fight. The game is played using two screens, with the action on the bottom screen, and the statistics and challenger information appearing on the top. At the sides of the ring in any fight you may spot a few familiar faces. Between the second and third ropes you can see Mario on the left and Donkey Kong on the right. Above the third rope you can also see Donkey Kong Junior and Luigi (who looked exactly like Mario at the time).